IF THE FALL IS THE START of a year-long marathon, we’re off to a great start. As the winter season begins, schools such as Xaverian, Andover, and Needham have an early lead thanks to teams that brought home state championships in football, swimming, and soccer, respectively. But now it’s time to hand off the baton. The fall coaches did their job, pulling student-athletes’ focus away from the beach and over to long practices and hard work. The goal was simple: turn teenagers into champions. For some, such as the Bishop Feehan swim team and the Newton North volleyball team, the payoff was huge. Nothing can match the celebration enjoyed by a handful of teams and individuals this fall. Selecting 10 worthy success stories from a season filled with candidates isn’t easy. Here, in no particular order, are 10 we thought stood out. The best game of the fall didn’t take place at Gillette Stadium, Worcester State, MIT, or even Harvard. 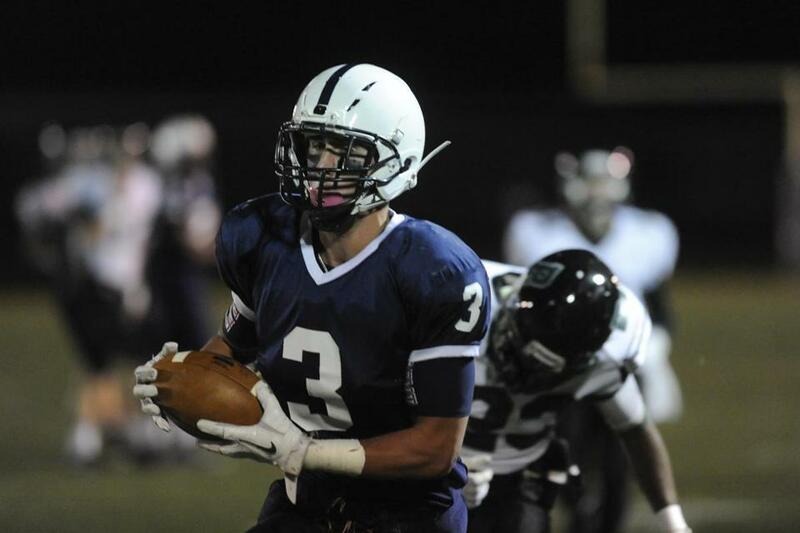 It was held on Nora Searle Field in Dover on Fri., Nov. 7. The Division 3 South girls’ soccer game between Dedham and Dover-Sherborn was decided in the 17th round of a shootout when Dedham sophomore Kelsi Brennan came off the bench to score the winning goal. Officially it went into the books as a 1-0 win. That night there was a record number of football games along with 18 other soccer tournament games. For us, the longest soccer tournament game in state history rated a sentence in our roundup. It certainly deserves a few more here. After beating Amherst for their second state soccer title in three years, Needham players visited coach Don Brock in his hospital room where the longtime coach was recovering from illness. We can only imagine what it was like for the staff at Leonard Morse Hospital in Natick. When a health scare sent Needham boys’ coach Don Brock to the hospital in the middle of the tournament, soccer took its place along side stethoscopes and annoying tests. But the winningest soccer coach in state history wasn’t out of touch. “One of our coaches texted him the result and he just said, ‘let’s go get one more,’ said Needham assistant Jay Steeves after the Rockets beat St. John’s Prep in the EMass final. They did, beating Amherst-Pelman, 4-0, for their second Division 1 state title in three years. The MIAA trophy went to Needham, but only after a stop at a Natick hospital. 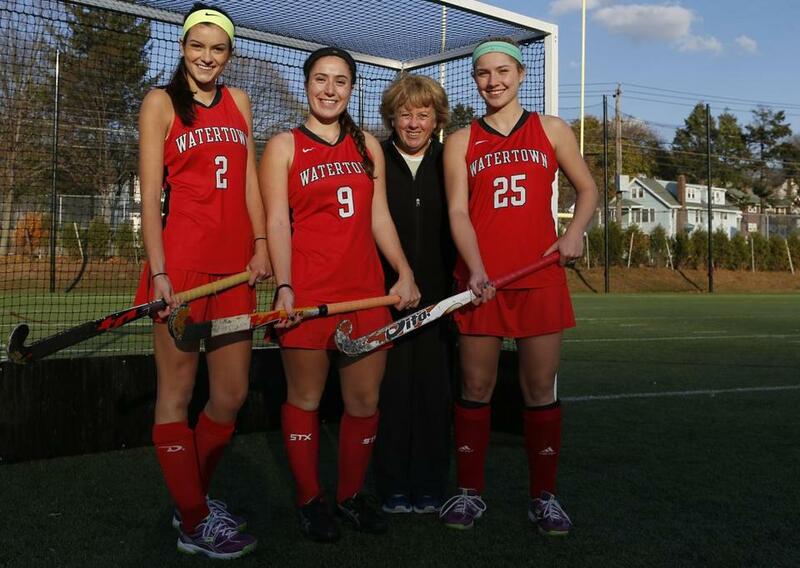 Watertown field hockey All-Scholastics Allie Doggett, Emily Loprete, coach Eileen Campbell, and Rachel Campbell. If losing builds character then Alexandra Doggett, Emily Loprete, and Rachel Campbell are in trouble. That’s because in their All-Scholastic careers as members of the Watertown field hockey team they’ve never lost a game. After a 23-0 season that included their sixth straight state title, the unbeaten streak is now at 138. Watertown beat Auburn, 5-0, in the state title game and the important number there is 0. In the 2014 season, the Raiders and goalie Maddie Rocklin didn’t allow a single goal. “The fact that these girls didn’t give up a goal the whole season is ridiculous,” said coach Eileen Donahue. And, if you ever forget the streak total, swing by the back of Watertown High. You can’t miss the number. Chris Garrison and Lawrence Academy won the ISL’s Team Sportsmanship Award this year. No one likes to rehash it, but to understand how far Lawrence Academy has come you have to remember how bad it was. Following a 2010 football season that made national news, the Spartans were slapped with a long list of sanctions by the ISL, including a three-year probation. With all that in the rearview mirror, LA began the year with a loss to Governor’s. But what followed was an eight-game win streak, including a win in the NEPSAC postseason. But the best part? LA won the ISL’s Team Sportsmanship Award. “I could not have been prouder of our players and it meant a lot to our school,” said coach Paul Zukauskas. To understand the thing that drives women field hockey coaches bonkers, look to the Division 1 EMass field hockey final between Acton-Boxborough and Dennis-Yarmouth. Reporters, both print and television, were there to see if D-Y goalie Max Allen could beat the Colonials. Meanwhile, a short time later on the same field, Watertown would raise its nation-best active unbeaten streak to 137, but most of the reporters were long gone by then. D-Y lost to A-B, 3-0, but Max did his part. The Colonials went on to win the state championship led by Michigan-bound Leah Cardarelli. But she doesn’t get the headline here. See what I mean? With 12 state titles heading into this fall, Andover coach Marilyn Fitzgerald knew something about beating an opponent. But this season there was an extra challenge for the coach of 23 years. After being diagnosed with cancer for a third time, Fitzgerald would drive into Boston for treatment in the morning, then head back to Andover for swim practice, never missing a day. “Ms. Fitz is just amazing,” said senior Caroline Murtagh. “The big thing that she’s shown me is how to stay positive despite adversities that we might face.” Andover won the North sectional and followed it up the next week at Harvard with state title No. 13. 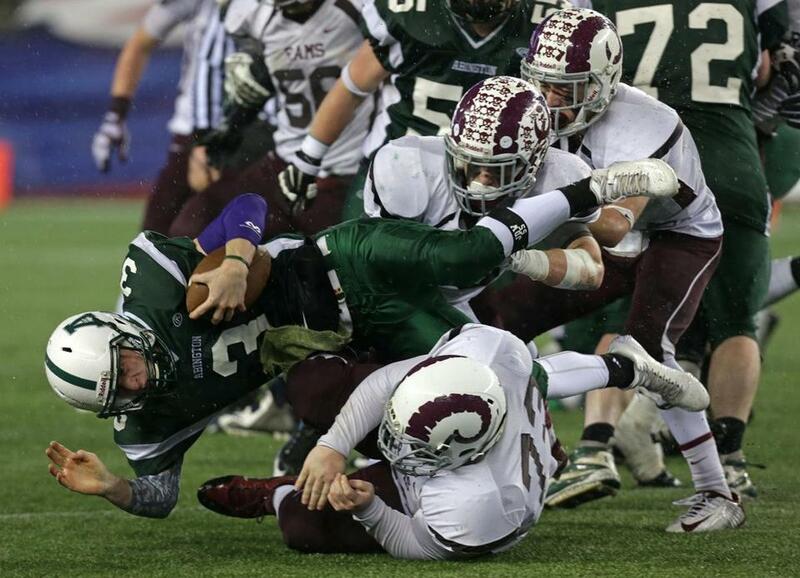 Abington blew out Northbridge in the Division 5 Super Bowl. 7. Year 2 of the format: what do you think? The 14,000 fans who watched the Super Bowl games at Gillette were treated to a great day. Ok, maybe the games were lopsided, and the rain didn’t help, but Year 2 of the state playoff system ended with six state champions, all crowned at the best venue in Massachusetts. With one year left in the current format the MIAA will begin surveying members this month to see what they like and dislike. Some say the format is ruining Thanksgiving games. Some say you can hear the crickets at games that don’t involve the playoffs. And many are disappointed the state’s 375 member schools won’t get the chance to vote on the format’s future like they did in 2012. Any guesses how it will turn out? Not here. For the record, Nick Carleo finished 67th at the All-State cross-country meet his freshman year and Erin Dietz was nowhere to be found. That’s certainly changed. This fall Newburyport’s Carleo won his second straight Division 2 state title, finishing the Franklin Park course in 15:51. Bedford’s Dietz won the girls’ Division 2 title, finishing in 18:19. Dietz took it a step further by being the lone EMass qualifier to the National Cross-Country championships in San Diego Saturday, after finishing fifth at the Northeast regional race. Deadlines prevent us from telling you how she did in California. But we can tell you it’s warmer where she is. Richard Barton coached Newton North to its 17th volleyball state title this fall. On the way to its expected 17th state volleyball championship, someone got in Barnstable’s way. That someone was Newton North, which beat Barnstable, 3-1, in the state semifinals and then went on to beat Andover in the Division 1 final. The championship was everything you’d hope for in the biggest match of the year, with the Tigers winning, 12-25, 25-21, 20-25, 25-12, and 15-10. “It’s so eminently satisfying,” said Newton North coach Richard Barton of his team’s first state title. “It’s such an accomplishment.” His strategy was simple and familiar. “We just kept the pedal to the metal.” Others did, too. Hopkinton won the Division 2 title and Frontier won its fifth Division 3 title. Those who think Thanksgiving football doesn’t mean as much as it used to clearly weren’t at the 88th meeting of Barnstable and Falmouth. In a pregame ceremony, Barnstable retired No. 46, the jersey number of former Red Raider captain Kevin Houston. A Navy SEAL, Houston was killed in 2011 when a helicopter he was flying in over Afghanistan was shot down. Houston’s family was on hand for the ceremony, which included a presentation of Houston’s game-worn jersey from the 1993 season, his senior year at Barnstable. Houston would have appreciated how the Thanksgiving game ended, on a last-minute defensive stop and a Barnstable win.